Some of Europe’s earliest traces of civilization are found in modern Greece along the Aegean sea. During the Bronze Age, two prominent archaeological cultures emerged in the Aegean. The culture of the island of Crete, sometimes referred to as ‘Minoan’, was Europe’s first literate civilization, and has been described as ‘Europe’s first major experience of civilization’. However, the Linear A syllabic ideographic and Cretan hieroglyphic scripts used by this culture remain undeciphered, obscuring its origins. 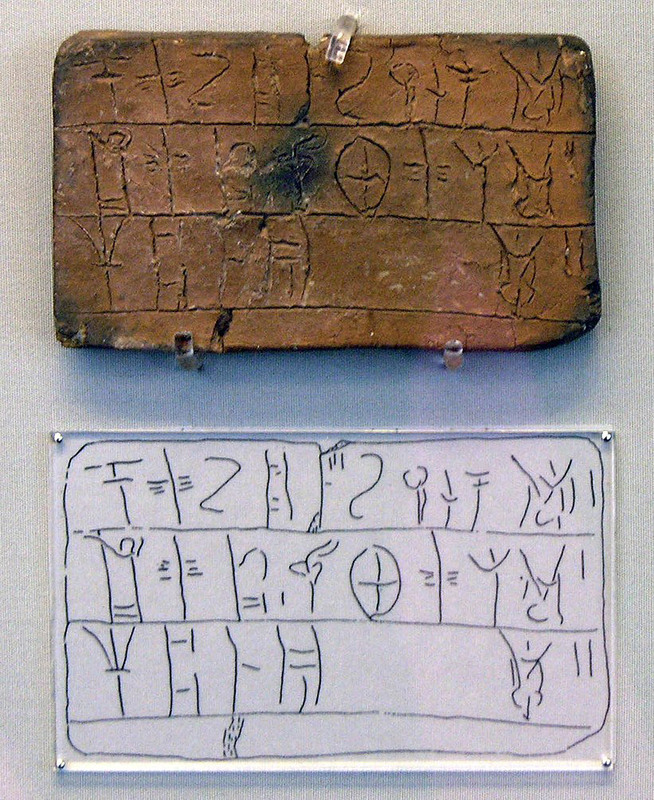 Equally important was the civilization of the ‘Mycenaean’ culture of mainland Greece, whose language, written in the Linear B script, was an early form of Greek. But where did these civilizations come from and who were these people that build some of the first civilizations in Europe? Scholars have long debated the origins of the Greeks whose language, like that of the Armenians, belongs to the Indo-European family tree. Robert Drews in his book The Coming of the Greeks (1988) described how the ancestors of the Greeks came to Europe from the Armenian Plateau bringing with them their Indo-European language and their inventions of chariot riding and horse breeding. It is certain that the inhabitants of the forested areas of Armenia very early became accomplished woodworkers, and it now appears that in the second millennium they produced spoked-wheel vehicles that served as models as far away as China. And we have long known that from the second millennium onward, Armenia was important for the breeding of horses. 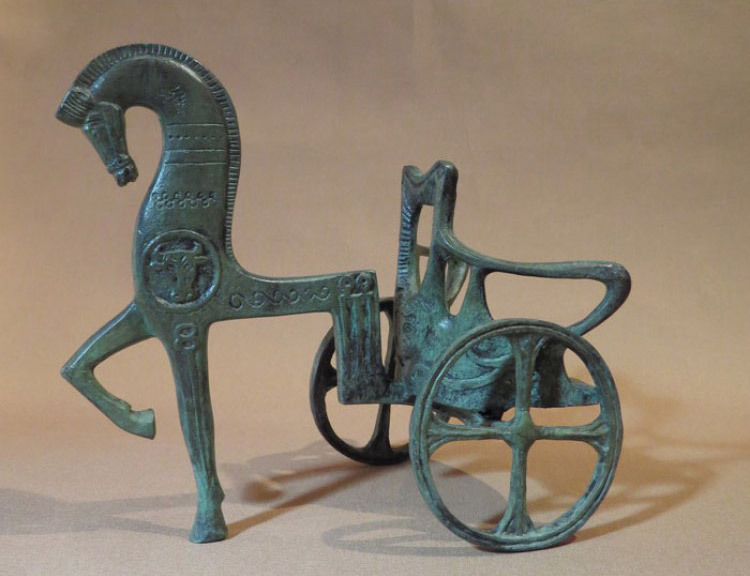 It is thus not surprising to find that what clues we have suggest that chariot warfare was pioneered in eastern Anatolia. Finally, our picture of what the PIE (Proto-Indo-European) speakers did, and when, owes much to the recently proposed hypothesis that the homeland of the PIE speakers was Armenia. The Armenian plateau hypothesis gains in plausibility by the fact that we have discovered evidence of admixture in the ancestry of Yamnaya steppe pastoralists, including gene flow from a population of Near Eastern ancestry for which Armenians today appear to be a reasonable surrogate. Some of the world’s oldest traces of human transition from hunting gathering to farming, can be found on the Armenian Highlands. It is therefore not a surprise that many scholars believe that the Indo-European language originated on this Highland. Similar observations have been made regarding early European art and its similarities with ancient Armenian art. Common ancestry for the Armenians and the Greeks have long been hypothesized by both ancient historians and modern linguists. The ancient Greek historian Herodotus (440 BC) believed that Armenians had Greek ancestry being related to Phrygian colonists. Several linguists have similarly proposed a Graeco-Armenian language hypothesis based on similarities between the Greek and Armenian language. Professors at the University of Auckland Russell D. Gray and Quentin D. Atkinson (2003) equally supports a Graeco-Armenian subgroup and dated the split between the Armenian and Greek languages to 7000 years ago. As science progresses however studies investigating ancient DNA offer a more comprehensive understanding of the past based on genetics of ancient and modern people. A brand new DNA study on the Genetic origins of the Minoans and Mycenaeans, published in Nature magazine and led by Iosif Lazaridis (2017), a population geneticist at Harvard University, has shed much needed light on the origins of the ancient Greek civilizations. 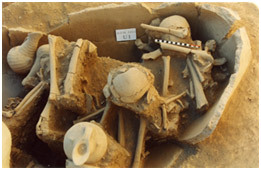 Harmanören Göndürle in southwest Anatolia Burial jar containing three individuals with grave goods. They have tested the DNA of 19 ancient individuals. 10 Minoans from Crete dated to approximately 2900-1700 BC, 4 Mycenaeans from mainland Greece (approximately 1700-1200 BC), 1 individual from a village interestingly called Armenoi (Greek: Αρμένοι for Armenians) in western Crete (approximately 1370-1340 BC), 1 sample from the southern Peloponnese (about 5400 BC), and 3 Bronze Age (2800–1800 BC) individuals from Harmanören Göndürle in southwestern Anatolia (modern Turkey). The researchers further assessed data of 332 other ancient individuals from previous studies and 2616 present-day individuals. The study revealed that the ancestors of the Greeks, the ancient Minoans and Mycenaeans were genetically related to one another and trace their origins from the ancient people of Anatolia and the Armenian Highlands. 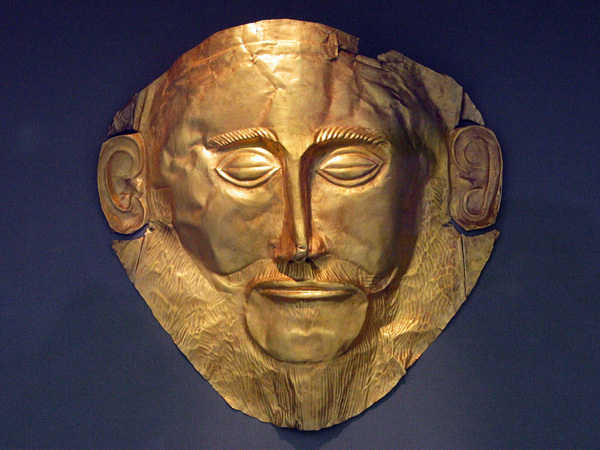 Death mask, known as the Mask of Agamemnon, 16th c. BC, the most famous artifact of Mycenaean Greece. The bulk of their DNA seems to have come from the so called Neolithic Anatolian Farmers who swept across Anatolia during the Neolithic revolution into Europe. Much of the rest of their genetics is traced to the east of Anatolia. The Lion Gate was the main entrance to the Bronze Age citadel of Mycenae, the center of the Mycenaean civilization. To identify more proximate sources of the distinctive eastern European/north Eurasian-related ancestry in Mycenaeans, we included later populations as candidate sources (Supplementary Information section 2), and could model Mycenaeans as a mixture of the Anatolian Neolithic and Chalcolithic-to-Bronze Age populations from Armenia (Table 1). Populations from Armenia possessed some ancestry related to eastern European hunter–gatherers, so they, or similar unsampled populations of western Asia, could have contributed it to populations of the Aegean. This model makes geographical sense, since a population movement from the vicinity of Armenia could have admixed with Anatolian Neolithic-related farmers on either side of the Aegean. Regardless of the various possibilities of how the ancient Greeks received Armenian genetics, it is evident that ancient Armenian genetics played a role in the formation of the early Greek ethnos. Further support could be gained by analyzing ancient DNA samples from the many archaeological sites in historic Armenian territory in today’s Eastern Turkey, which the Turkish academia has yet to release. Indeed the ancestors of those who build the first civilizations in Europe seem to have come wholly or at least partially from the Armenian Plateau through Anatolia all the way into Greece, bringing with them their Proto-Indo-European language which later would evolve into Greek. The analyses of the Y-chromosomes of the ancient individuals also reveals striking similarities with Armenians. The eastern influence in the Bronze Age populations from Greece and southwestern Anatolia is also supported by an analysis of their Y chromosomes. Four out of five males belonging to Minoans, Mycenaeans, and southwestern Anatolians (Supplementary Information section 3) belonged to haplogroup J, which was rare or non-existent in earlier populations from Greece and western Anatolia who were dominated by Y-chromosome haplogroup G2. 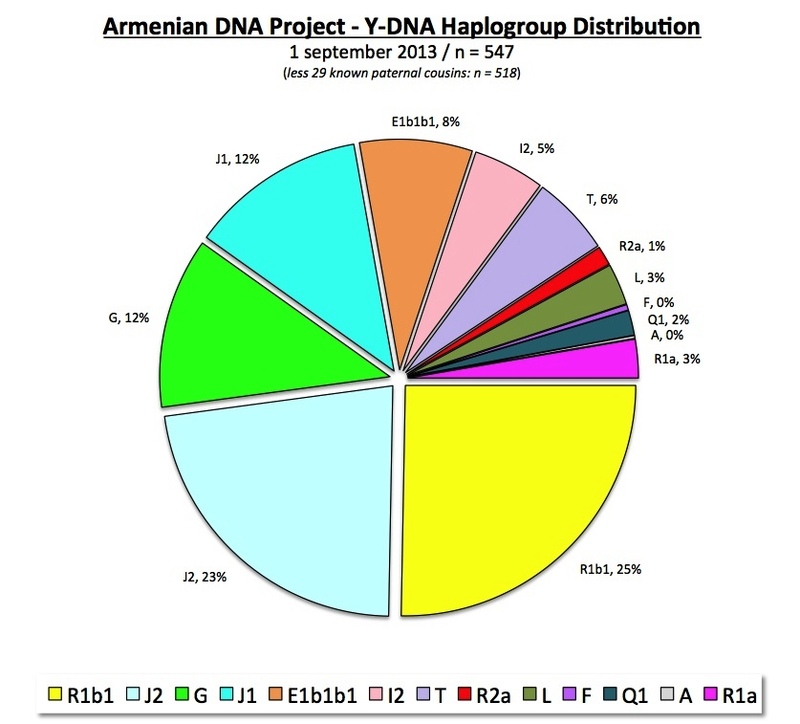 Along with R1b1, J and G2 are the most common Y-chromosomal haplogroups among the Armenians and was equally present among the ancient samples. Phenotype prediction from genetic data has enabled the reconstruction of the appearance of ancient Europeans, who left no visual record of their pigmentation. By contrast, the appearance of the Bronze Age people of the Aegean has been preserved in colourful frescos and pottery, depicting people with mostly dark hair and eyes. We used the HIrisPlex26 tool (Supplementary Information section 4) to infer that the appearance of our ancient samples matched the visual representations (Extended Data Table 2), suggesting that art of this period reproduced phenotypes naturalistically. …the discovery of at least two migration events into the Aegean in addition to the first farming dispersal before the Bronze Age, and of additional population change since that time, supports the view that the Greeks did not emerge fully formed from the depths of prehistory, but were, indeed, a people ‘ever in the process of becoming’. Considering that some of the oldest traces of the Neolithic Revolution are found on the Armenian Plateau in the eastern parts of Anatolia, it is safe to say that the invention of farming spread to western Anatolia and later further into Europe including Greece from the Armenian Plateau. This would also explain well the genetic affinity that exists between the Armenians and the Anatolian farmers and the ancient Greeks. The spread of civilization connects all of these groups both genetically and linguistically, irregardless of how distinct they became in later millennia. All in all it’s an interesting study, that inevitably raises a lot of new questions, but provides us with much needed insight into the genetic origins of some of the earliest European civilizations. *the rest of sources are linked within the article at the appropriate phrases. Malcolm, I too am shocked at how important Armenian culture is to the world with its rich early history. It is a sad reflection on the western tendency to want to date civilization more from the Greek era rather than from its eastern pre-cursors. This article explains a lot regarding the results of my DNA. Was always told I was Armenian! Surprised to learn I am as much Greek as I am Armenia. 29% Greek ,34% Armenian. Now I understand why. Thank you so much? I also thought I was 100% Greek, only to find out I have percentages of Caucasus, Armenian and Euro plus Italian ( the Phoenician influence) .. this articles of Armenia have really helped me figure out why It shows in my DNA.. Interesting reading but it contradicts the existence of Hitites and Trojans , sounds like there’s a cover up and some historical dishonesty going on here.